Using mobile devices for work is a big trend for modern workers. They look for business access from multiple locations using mobile devices such as smartphones, laptops, and tablets. For IT, this means delivering highly secure, reliable mobility to employees and guests. We talked about the Cisco 802.11ac Solution, Migrating to Wave 2 and Wave 2 AP. In the With 802.11ac connections, organizations benefit from a reliable wireless network that supports a broad range of applications. Well, what’s the 802.11ac? Why is it so necessary today? In the following part we will talk to you about the Cisco 802.11ac Solution. 802.11ac, the successful predecessor of 802.11n, is a transformational wireless LAN technology that represents a significant performance increase over the previous one. The 802.11ac IEEE standard allows for theoretical speeds up to 6.9 Gbps in the 5-GHz band, or 11.5 times those of 802.11n. 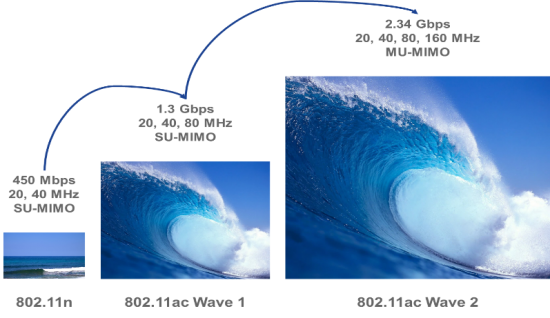 802.11ac is coming to market in two releases: Wave 1 and Wave 2. 160 MHz channel width is added to the current support of 20, 40 and 80 MHz channel widths with Wave 1, providing a boost in performance up to 2.34 Gbps from 1.3 Gbps with Wave 1. Companies have the flexibility and option to manage the amount of available wireless spectrum deployed within their network as and when appropriate. Why are there two 802.11ac “waves”? 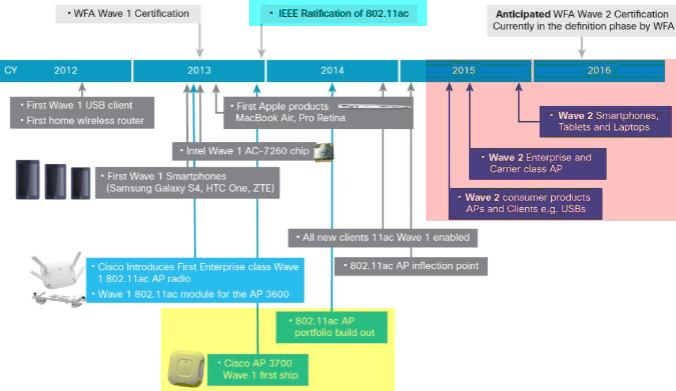 The 802.11ac IEEE standard is being introduced to the market in a series of “waves” (releases) of new products and technology. The reason is that the capabilities in 802.11ac are numerous, and delivering them in waves allows the industry to take advantage of many without having to wait for all capabilities to be available. The standard defines a framework that provides a significant step beyond 802.11n and allows for growth into the future. Wave 1 hardware and Wave 2 hardware are not compatible with each other. 802.11ac Wave 1 required new hardware in both access points and client devices to deliver channel widths up to 80 MHz, 256 quadrature amplitude modulation (256-QAM), and up to three spatial streams. The result was a maximum data rate of 1.3 Gbps, or about three times the top-end 802.11n products in the market. 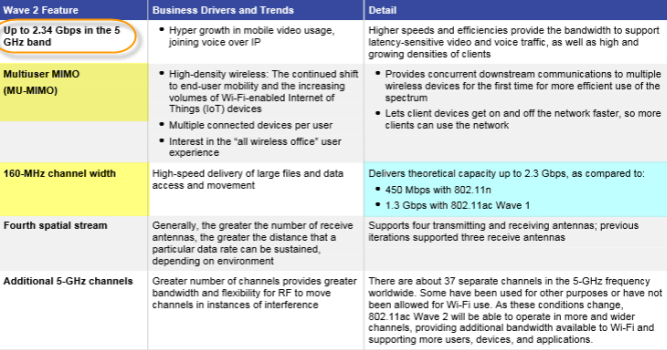 Similarly, Wave 2, a superset of Wave 1, requires new hardware in both access points and client devices to support the additional 802.11ac capabilities such as MU-MIMO, channel widths up to 160 MHz, and the potential for a fourth spatial stream. 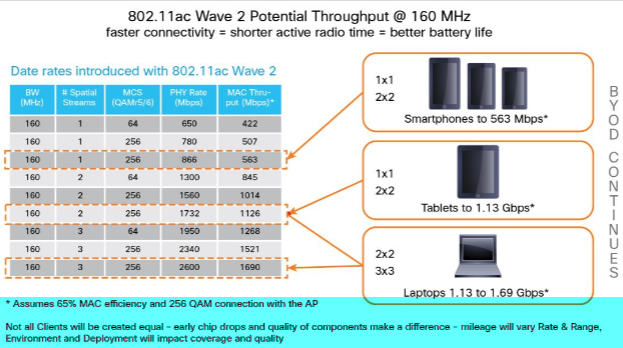 Will 802.11ac Wave 2 continue to support 802.11ac Wave 1 and other 5-GHz protocols? Yes, 802.11ac Wave 2 access points will interoperate with 802.11ac Wave 1, 802.11n, and 802.11a client devices. Support for all Wave 2 features, however, requires Wave 2 support in both the access point and in the client. MU-MIMO stands for multiuser multiple input, multiple output, and is a brand new feature introduced with 802.11ac Wave 2. Wave 2 MU-MIMO support is required on both the access point and client device to work. It operates in the downstream direction, access point to client, and allows an access point to transmit to multiple client devices simultaneously. This differs from Wave 1 and previous single-user (SU)-MIMO 802.11 iterations, in which an access point transmits to a single client device at a time very quickly and efficiently. 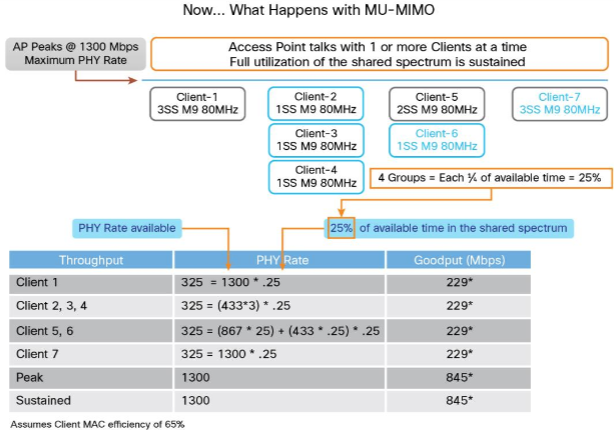 MU-MIMO will share all of the available wireless spectrum across multiple client devices, thereby optimizing the efficiency of the wireless network while servicing more client devices. 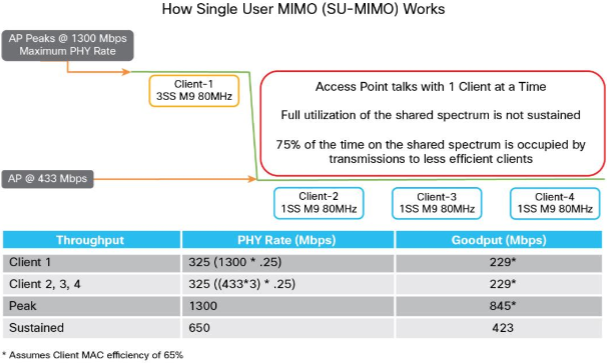 Contrast this with today’s SU-MIMO where the network services a single client at a time and based on the type of client the wireless spectrum can be fully utilized or a portion of the network left idle as a client is connected. e.g. 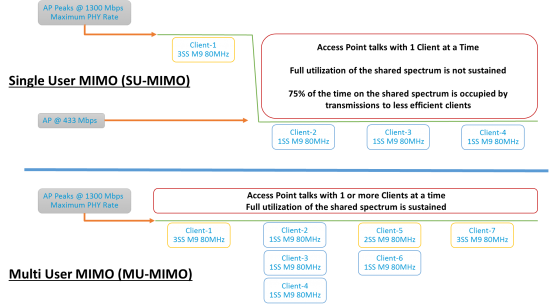 1 Spatial Stream (SS) smartphone or tablet, or 2SS tablet or laptop rather than alternating up and down based on the type of individual client connected with the AP in a SU-MIMO environment.